The seller of this Chevelle believes that it was turned into an “SS tribute” long before that was a cool thing to do. They think it may have been done in the eighties, but aren’t really sure. Heck, they aren’t even sure if it’s a clone or the real deal. Some people must think it’s worth picking up though because bidding is really starting to heat up here on eBay. 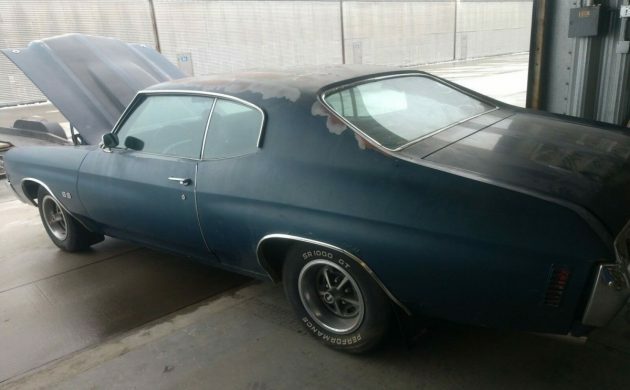 The auction doesn’t have a reserve and is ending soon, so it’ll be interesting to see what this mystery Chevelle goes for. So, could this actually be an SS? 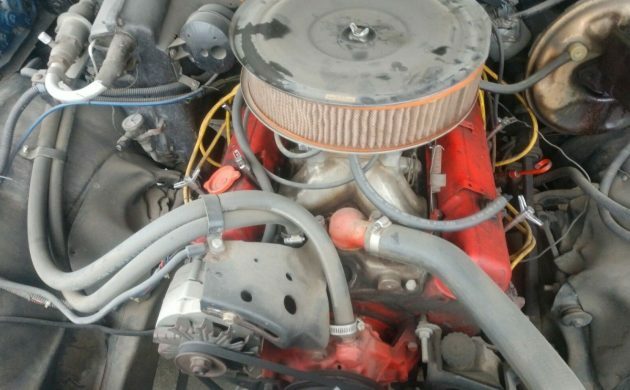 If this was a pre-71 Chevelle, that small block would disqualify it from SS status, but this was the first year that you could get any V8 in any trim level. That 350 is claimed to run strong and is attached to an automatic transmission. A big block would have been more exciting, but this engine will be more affordable to upgrade or replace if needed. The power steering and power brakes are in place, but the AC compressor has been removed. Those bucket seats are a welcomed sight! Now, I’m starting to wonder if this really could be an SS. It has the right hood, grill, and all the interior bits. Door panels, steering wheel, center console, etc. If this isn’t the real deal, someone did a lot of work finding all the parts needed to make the swap. A job like that would be easy today with all the companies reproducing parts, but I’m guessing it would have taken many junkyard visits back in the eighties. Blast! That confirms it. It’s not an SS. In place of that sweeping hand speedo, there should be a round gauge cluster. Oh well, we all knew it was too good to be true. So let’s focus on what makes this car good instead. It appears to be relatively solid and has a cool look to it. There’s a running engine under the hood and lots of upgraded SS parts inside. The options that it did come from the factory with are good and it could still be a lot of fun to own. So, what do you think about this Chevelle? It’s not an SS and it’s definitely not perfect. There are a few bubbles forming over that rear fender and the paint has seen better days. The drivetrain will probably need refreshening and who knows what else. Still, with all it’s flaws, there is something very appealing about this old beater. Could it be the perfect alternative for someone who is more interested in driving than investing? Let us know in the comments below. Is it ok to pay for a counterfeit car with counterfeit money? No reason to sob for it being a non-SS.The lesser version will sell for lot less $,meaning one more lucky enthusiast can enter the hobby of classic cars. Heck,this is more or less an SS already!Cool car ;I love high-revving SBCs! It’s nice that the seller included a picture of the trim tag, but unfortunately the 71 trim tag won’t identify a car as an SS. That said, it doesn’t appear to be an SS. 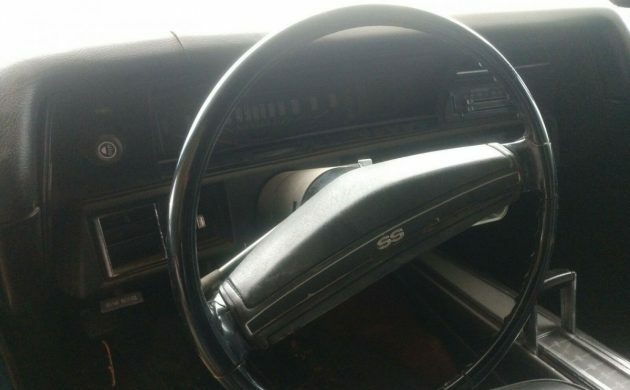 All SS’s came with the round speedometer dash, even if functioning gauges weren’t ordered. This car has the straight speedometer dash, that was only used in regular Chevelles. Also an SS would have an SS badge in the center of the rear bumper. Building “tribute”, “clone” or bogus muscle cars, is nothing new, and I wouldn’t be surprised if this car was done in the 80’s, or even earlier. There were plenty of imitation muscle cars floating around when I was in high school. I had a friend who had a regular 69 307 Malibu that had a full SS conversion, including the hood, wheels, SS exhaust tips, black grill, black tail lamp panel, and SS 396 emblems, and this was in 1971! The only give away to it’s real identity was that it still had the 307 front marker light bezels. I also knew a 340 Cuda with Hemi badges, and I had a buddy with a 66 6 cylinder, 3 speed Mustang, that he added Mustang GT stripes and the GT fog lamp grill too. It wasn’t the least bit uncommon for regular Nova’s to be seen with SS emblems, or to see a LeMans with a GTO hood and emblems. 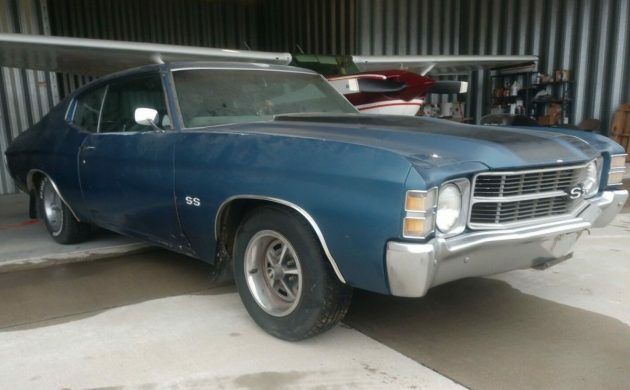 For someone who wants to build a 71 SS clone, this car’s a real good starting point. Really enjoyed your article on my old Chevelle. I don’t know how it got on here, but Thank you! I’m an avid reader and bet you couldn’t imagine my surprise to see my own car. How cool is that? Thank you again! People have been cloning these since they were pretty much new. I had a 67 in 1984 that was a Malibu cloned to SS396 for years before I got it. In the mid 70s I bought a 70 Chevelle Malibu “350”. 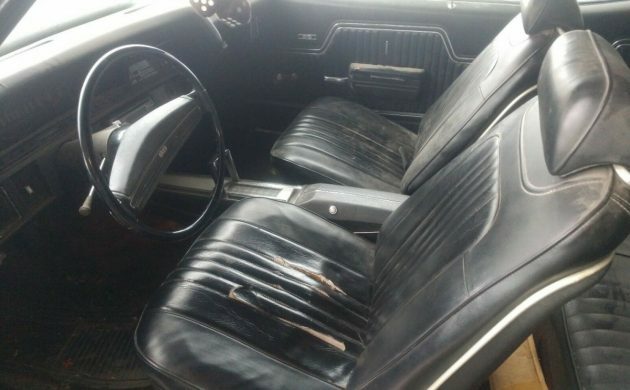 It was factory option with bucket seats and the same console the SS had. Of course I turned it into an SS but looking back, this what I’d call poor man’s SS would be interesting to have now. I’m sure not many if any survived. It ran well, had the 250 horse motor and away bars. Put a lot of money into it, sold it for a loss when I got my first real job and needed a car that got better than 7mpg. Cars were meant to have fun with, someone will definitely have fun with this small block screamer. Clone, tribute, street cruiser, just for kicks, whatever reason for the SS enhancement, any number of reasons really, probably cause it just looks so darn cool. Nice machine. I talked to a father and son team a few years back. They took a ’70 Chevelle wagon down to the frame and brought it back as an SS clone with induction functioning hood, proper badging, buckets, console, etc. Painted a blue of that year, black interior and white stripes. An absolutely stunning vehicle! They had a great time building it together and you could see the pride! Overdone? Probably! To them it was time spent together, you cannot put a price on that! I loved that car! !